The Ultimate Hamper is our biggest healthy hamper selection and is jam-packed with natural goodies and low sugar treats. It is an ideal gift for health-conscious friends and family who love following a balanced diet. Carefully hand-packed in this extra-large wicker basket are no added sugar Christmas pudding, buttery shortbread, chocolate chip cookies, warming soups, crunchy oatcakes, dark, white and milk chocolates naturally sweetened with stevia, a sensational sweet selection, luxury mixed nuts, sweet apple crisps, cheese and gourmet popcorn. There is also nourishing wholesome porridge oats, organic baked beans, whole wheat couscous and rich Italian passata. 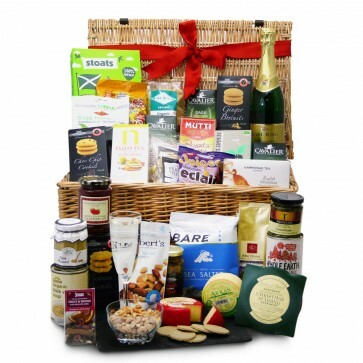 The diabetic friendly food and drink in the Ultimate Hamper are carefully packed by hand in a gorgeous gift box. Remember to tell us what you’d like written on the personalised gift card included inside.